A Different Theatrical Experience Where Attraction Battles Suspicion. 39 Defaults is a play that explores the trust between two strangers in an era where hospitality meets surveillance by situating both performers and spectators in an immersive theatrical environment. Los Angeles, January 19, 2016 (Newswire.com) – A Catalan political activist on the run from the law is invited by an American woman into her DTLA loft apartment. In this intimate and interactive theatrical space shared by both audience and actors, attraction battles suspicion, and the fractured encounter between the characters prompts the question: is trust really possible in an era when hospitality meets surveillance? The play breaks the distance with the audience and gives them a new theater experience. After the play, the audience will be invited to share a glass of wine with the cast and discuss about what they have just seeing. The play is designed to open a must needed political dialogue. The story behind the play is inspired on the actual Enric Durán, also known as Robin Bank.Durán is a Catalan activist that announced he “robbed” dozens of Spanish banks, from which he took nearly 500.000 euros in loans, as part of a political action. 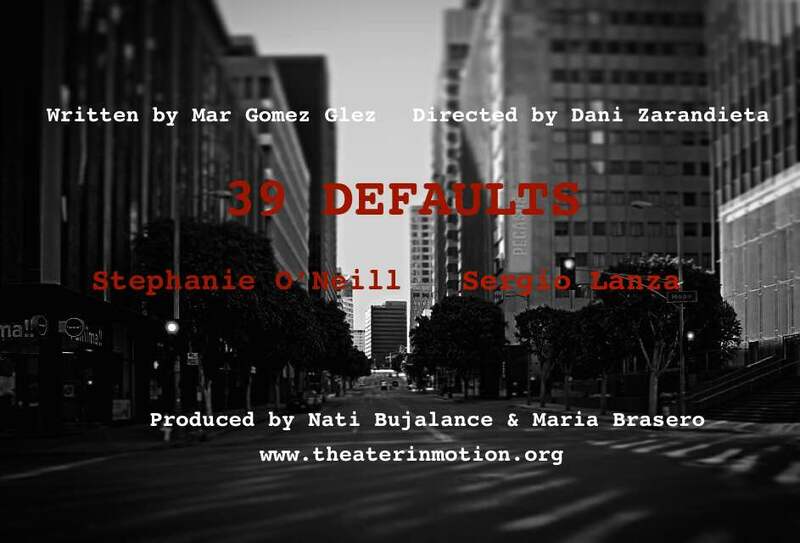 AFTER 2 YEARS IN NYC AND 1 YEAR IN MADRID, ’39 DEFAULTS’ COMES TO LA. A DIFFERENT THEATRICAL EXPERIENCE WHERE ATTRACTION BATTLES SUSPICION! The play was written by the Spanish-born, award-winning playwright Mar Gómez Glez, whose work, “Wearing Lorca’s Bowtie,” premiered Off-Broadway at The Duke Theater and was described as “sincere, impressionistic… powerful” by Backstage. The piece is directed by Spanish director Daniel Zarandieta, whose award-winning short films were screened at Cannes and his first feature film “Encontrados en NYC“, premiered at X European Film Festival and it was recognized in many other international festivals. The cast includes: Sergio Lanza, one of the key players in Spain’s Micro-Theater revolution, is a half-Argentinian half-Spanish actor with a career spanning 20 years and 3 continents. The piece is the second work of the company Theater in Motion and it is presented by Valencia Cultural Point. 39 DEFAULTS was presented by La MAMA ETC in 2014 and premiered in Teatro Stage Fest in 2012. It has also played at Teatro Guindalera in Madrid in Fall 2014. THEATER IN MOTION is an international theater company founded by Maria Brasero, Natividad Bujalance and Daniel Zarandieta with the goal of global collaboration, performing in different languages and styles in order to foster a new relationship with our audience. Theater In Motion invokes the audience not only as spectator, but as the integral creative element within the work, and therefore essential to the creative process. The space is provided by our sponsor, VALENCIA CULTURAL POINT a non-profit Corporation whose main purpose is to establish cultural ties between Los Angeles (California) and Valencia (Spain), by supporting cultural activities and hosting cultural events throughout Southern California. High-resolution image can be emailed upon request. Siguiente artículo ¡BROADWAY WORLD recomienda 39DEFAULTS!